I am not sure what I expected to learn when my wife Ann and I watched this movie a few nights ago. I thought that it would be somewhat of a bio-pic detailing the former First Lady's life before and after the White House. I was wrong about that. The movie focuses on the aftermath of her husband's assassination. It was a moving depiction of the trauma of that event and how she navigated feelings of shock, rage and anger. 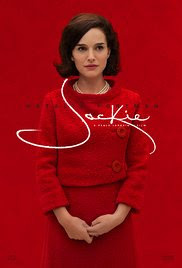 It gave me a new appreciation for Jackie. Images of the president dying in her lap helped me understand how impossible the situation was for her. I thought that Natalie portman did a good job in the title role. Yet the story itself overshadowed her acting. Watching this movie brought me back to that awful day in a high school in Brooklyn when I learned that President Kennedy was murdered. I liked the movie and, on a scale of ten, give it ★★★★★★★☆☆☆. I liked the movie too, I found it rather interesting!